This story was updated at 11:49 a.m. ET. CAPE CANAVERAL, Fla. ? 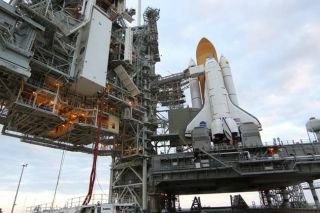 The space shuttle Discovery isleaking again, delaying its planned launch by at least one day ? to Nov. 2 ? asengineers scramble to fix the spacecraft in time for its last space voyage,NASA officials said. "Last night when we were doing our tank[pressurization] to flight mode, we did have a couple leaks thatoccurred," NASA test director Jeff Spaulding told reporters this morning(Oct. 29). "We tried to repair them overnight but weren't completelysuccessful in doing so." Discovery was slated to launchon its final mission on Nov. 1, but two leaks in one of its twinaft-mounted engine pods forced the delay. The leaks are in helium and nitrogenseals used to pressurize fuel line plumbing in one of Discovery's orbitalmaneuvering system pods. They are unrelated to a fuelleak on Discovery that NASA repaired last week, Spaulding said. Spaulding remained confident that the repairs could be doneeffectively and efficiently, saying that the agency's engineering teams havehad previous experience fixing these types of leaks. "The repairs, removal and replacement aren't verycomplicated, and we've done it in the past," Spaulding said. "It's fairlycommon ? a well-known process." Discovery is scheduled to launch on an 11-day mission to theInternational Space Station to deliver a new storage module and a humanoidrobot called Robonaut 2. The mission will be Discovery's 39th and last trip to spacebefore it is retired from service. Discoveryis NASA's oldest flying shuttle and has flown the most missions of anyorbiter in the space agency's fleet. NASA isending its space shuttle program and retiring its orbiter fleet ? Discovery,Atlantis and Endeavour ? next year to make way for a new plan aimed at sendingastronauts to visit an asteroid and Mars. Discovery'supcoming flight will be NASA's 133rd shuttle mission since the orbiters firstbegan flying in April 1981.